The Ancient Hematite "Crayon Pencil Stone" Recently Found in the Denisova Cave of the Siberian Altai Mountains of Russia Perhaps Points to an Astronomical Alignment ca. 43400 B.C. 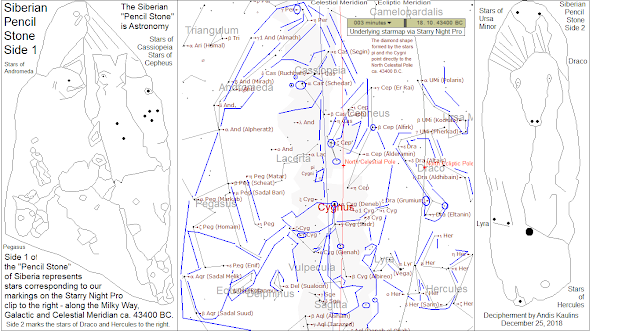 Based on photographs online of the so-called "Cave Pencil Stone"
with corresponding stars identified on the three stone "sides" as prominent stars of adjoining celestial regions, and with the main axis of Side 1 showing stars along the Celestial Meridian and Galactic Equator. "This summer we made a unique find for Denisova Cave. We call it a 'pencil', it has a natural pigment - hematite, which prehistoric artists, used for different art, while living in the cave." "The piece of hematite was processed." "Cave-dwellers used hematite crayon for art work in Altai Mountains...."
"The crayon was used to make reddish brown marks." "We cannot say how exactly it was used, but we believe it was for some artistic purpose. We previously found similar 'pencils' at Karabom Paleolithic site, some 120 kilometres from Denisova Cave. So far we do not know other similar finds, but we hope there will be more." -- indeed -- our suggested use of the stone is surely "artistic" in a way. 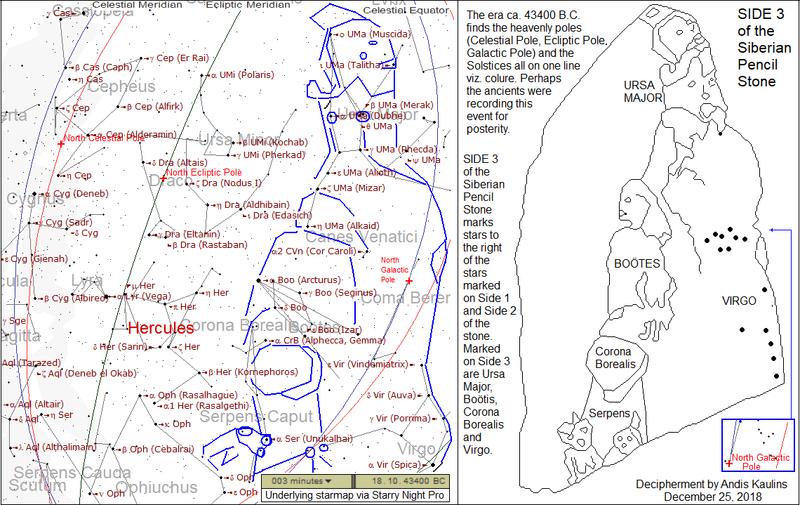 We have identified marks and figures on the stone in drawings and we interpret them to show that the stone had astronomical purposes, perhaps simply astronomical recordation, or for use as a "pocket map" of the stars, or indeed, for making astronomical drawings on stone, as another possibility, of course. Significantly, perhaps, our drawings seem to permit an astronomical interpretation of the pencil stone which would date it to ca. 43400 B.C., i.e. close to the estimated archaeological date of the layer in the cave where the stone was found, which the archaeologists say is 45,000 to 50,000 years ago. Normally, we would never accept -- and in the past have NEVER accepted -- such an early date for cave paintings or astronomical stones, also not in the prehistoric caves in France. It seems simply too far back in time for this kind of complex astronomy. Moreover, we always ask, if advanced technology is alleged to exist way back when, what happened in the interim period? There should be a clear, continuous record of use and improvement of any high technology allegedly known in ancient eras. Accordingly, we remain very skeptical of the early date, though the astronomy itself appears to be possible, so who knows? We must say, just for the record, that we would prefer a date of something like ca. 17480 B.C., one Platonic Year later, i.e. 43400 minus 25920 years, or even much later than that, but we must accept the archaeological dating of the layer in which the stone was found, which is 45,000 and 50,000 years ago, though we retain the possible explanation that the stone was buried into a layer that was older than the era of origin of the stone's use by man for astronomical purposes. Our astronomical decipherment of the stone suggests that the "processed" stone in the era of its origin may have been used -- as judged by stars and prominent marks for certain sections of the sky -- to record a singular celestial alignment -- on ONE line, or colure -- of the North Celestial Pole, the North Ecliptic Pole, the North Galactic Pole, and the Solstices, in ca. 43400 B.C., together with the near identity viz. close proximity of the virtually parallel lines drawn by the Celestial Meridian and the Galactic Equator in that era. 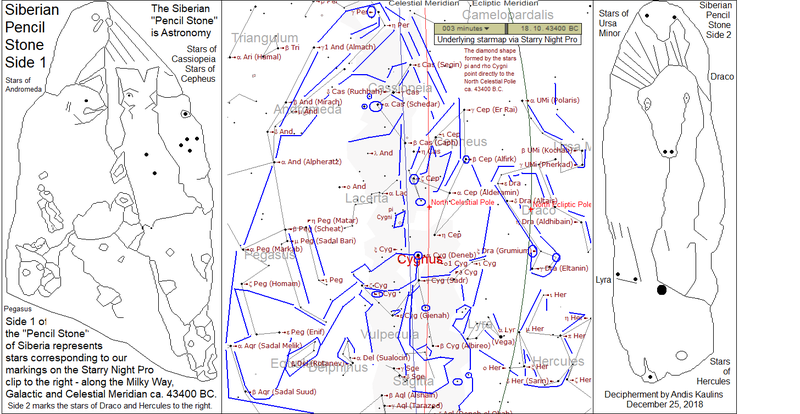 The ancients may have seen this as the "fundamental" alignment of the stellar universe. We do not enter here the current discussion of who the users of the stone may have been: Homo Sapiens, Denisovians, Neanderthals, cross-breds, sub-species, etc. Obviously, given the complexity of the astronomy, we do see in the marks and figures on the stone the forebears of modern human astronomy.